The Admissions and Financial Aid staff at PAFA are ready and available to help during all stages of the application and enrollment process. 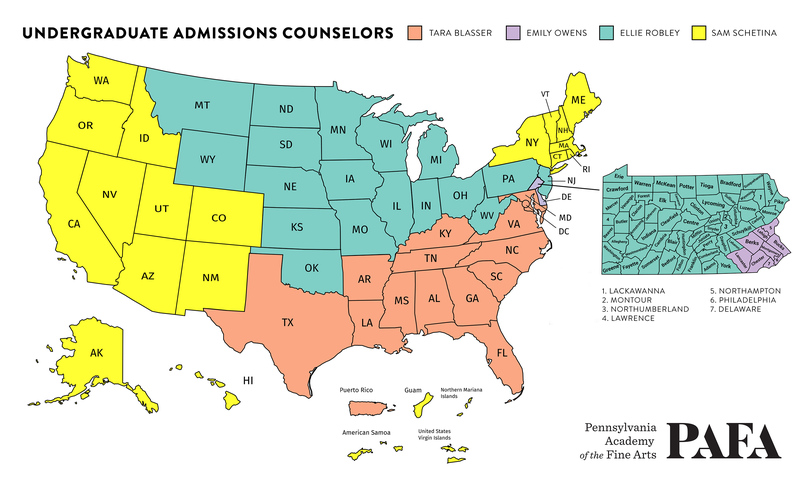 Students are assigned a personal Admissions Counselor from our team based on their geographic location. Casey Turner comes to PAFA with 30 years of experience in higher education, having served at Brown University, The University of Chicago, and Drexel University and as a branding and marketing consultant. Her passion for PAFA’s mission and for its community was instantaneous, and she’s grateful for the opportunity to lead PAFA’s very talented and dedicated Admissions Team as they introduce serious, maturing fine artists to all that PAFA has to offer. Residing in Elkins Park with her wife, daughter, and six cats, Casey is an avid reader, gardener, and political junkie. Peter is a native of Upper Darby, Pennsylvania (of Silver Linings Playbook fame) and earned his Bachelor of Arts in Psychology from the University of Dallas. He enjoys traveling, art, and, more recently, working on DIY restoration projects. He has worked in the Admissions Office for nearly ten years and currently oversees the department’s operations. But surprisingly, Peter’s connection to PAFA dates back even further. He visited PAFA’s museum galleries on a grade school field trip in the 1990’s. Clearly, it left an impression. Celeste Franklin comes to PAFA with 15 years of experience in higher education, having served at Louisiana Tech University, ITT Technical Institute, Everest College Phoenix, and Santa Fe University of Art & Design as a Director of Financial Aid and a consultant. Her passion for helping others has allowed her to guide students and parents, as well as institutions, towards making well-informed financial decisions. Although she holds two master’s degrees, she first earned her bachelor’s degree in Interior Design and considers herself to be an artist. She is grateful for the opportunity to work in a creative environment at an art school and support talented artists at PAFA. New to Philadelphia, Celeste enjoys volunteering at her church, trying new things, meeting interesting people, traveling the world and exploring the city. Emily Owens earned her BFA from the Minneapolis College of Art and Design with an emphasis in sculpture. She has lived and worked in various places on the east coast since 2013. She was born in the south but claims Iowa as her home state. Her three favorite things about living in Philly are biking to Chinatown for soup dumplings, the fact that there are always art events happening, and having a job where she gets to talk to students about their artwork. Tara Blasser earned her MA in Art Business from Sotheby’s Institute of Art in London. Tara's expertise lies in the art market and business aspects of auction houses, galleries, art fairs and more, thus bringing a unique perspective to PAFA Admissions. Originally from the Lehigh Valley, Tara has spent time traveling the world and lived in Jerusalem, Rome, and London before settling in Philadelphia. When she’s not at PAFA, she can be found working on her fixer-upper home, baking, or cuddled on the couch with her two cats watching The Office. Originally from Glendale, California, Sam is a practicing artist in Philadelphia, primarily working as a painter, but also engaging in fibers and weaving. He is interested in the ways in which repetition, intervals, pattern, and texture can be investigated pictorially, as well as physically, in relation to real, remembered, and imagined landscape. He is an Undergraduate Admissions Counselor for students from New England, New York, and the West (from Colorado to the Pacific Ocean) and is also the Admissions Counselor for the Post-Baccalaureate Certificate Program. Ellie Robley earned her undergraduate degree through the PAFA/Penn program with a focus on sculpture and creative writing. Originally from the UK, she’s spent the last decade in the US and the past 5 years in Philadelphia. After finding PAFA on a high school aptitude test she fell in love with the supportive community and is grateful to be a part of the staff, looking to find the next generation of great PAFA artists. When she’s not working, she can usually be found curled up with her dog and a good book. Student Ambassadors are the student face of PAFA, sharing their commitment and passion for the arts and the School by assisting in recruiting prospective students, as well as meeting with prospective students during our on-campus events and tours to talk about the student experience. Kaisha Daniels (Events Assistant): 3rd year Illustration BFA from Baltimore, MD. Laura Deliz (Tour Guide): 2nd year Painting BFA from Luquillo, Puerto Rico. Andy Fecile (Tour Guide): 2nd year Printmaking BFA from Garnet Valley, PA.
Daniel Flinchbaugh (Tour Guide): 4th year Painting BFA from Baltimore, MD. Maria Grajales (International Tour Guide): 2nd year BFA from Mexico City, Mexico. Kat Martinez (Tour Guide): 3rd year Painting BFA from Miami, FL. Tessy Tian (International Events Assistant): 3rd year Sculpture PAFA/Penn BFA from Beijing, China. Current or incoming students who wish to participate in PAFA's Student Ambassador program should contact Ellie Robley (erobley@pafa.edu).